Roast rice powder in a pan. In a bowl, add boiled water, 2 tsp of salt and roasted rice powder. Mix well. Make soft dough out of it. In an idli cooker, spread oil on the molds. Put grated coconut at the bottom of the molds. Now fill idiyappam dough in the idiyappam press with “Chillu” / lid at the bottom of the press. Press it to make thread like shapes and rotate into the molds. Now steam it on flame. 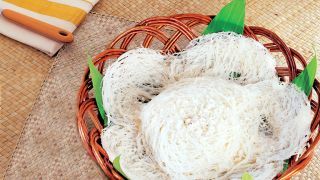 Tasty idiyappam is ready. Best side dish is vegetable kuruma/ egg roast/ meat curry.